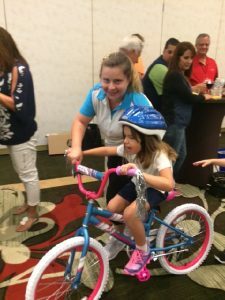 American Food Group recently had one of our instructors deliver a fun Build-A-Bike ® team building activity in Minneapolis, MN. American Foods Group, the 5th largest beef processing company in the US ( they process and deliver 6.5 million beef products!) decided to end their national sales meeting with philanthropy and fun. A dynamic group of 50 salesman and women came together at the Minneapolis Hilton to compete for honor and bike parts. One salesman was so motivated that he spontaneously did a gymnastic full body flip during a team cheer contest. Elizabeth.Reddall of the YMCA of the Greater Twin Cities came to accept the bikes with ecstatic families and children. She said, “Thank you so much for letting us be a part of this today. It was so much fun and all of the families were so grateful for the bikes. The smiles just made my day.” Reddall had also arranged to bring several bikes to their partner organization – Sioux YMCA. This South Dakota YMCA serves the children of the Cheyenne River Sioux Tribe Reservation. Reddall knew that these children were in great need of bikes. By the end of the event competition had switched to cooperation as the American Food Group teams worked together to add air to bike tires and adjust the seats for the children.